So much to do in July. Most Trails of History sites are open on July 4, but not all of them. As we like to say, please check ahead to make sure that the site you want to visit will be open when you plan to be there. July 9-Aug. 19: “Ice Age Mammals”—Anthracite Heritage Museum exhibit of wood carvings by artist Gene Moyer. July 14-Oct. 27: South Side Farmers’ Market—Saturdays 10 a.m. to 2 p.m. at the Scranton Iron Furnaces, offered in partnership with the Elm Street Revitalization Project. July 17-20: Exploring Pennsylvania: The Keystone State—Anthracite Heritage Museum summer day camp for kids ages 7-12. Fee charged and registration is required; call the museum at 570/963-4804 for details. July 22: Historic Scavenger Hunt—children ages 9 to 14 (and their accompanying adults) learn about local history by exploring artifacts and historic places; part of a series sponsored by the Phyllis Recca Foundation, this program benefits Brandywine Battlefield. Go here for details. July 8: Annual 5K Trail Run/Walk—Bushy Run is the site for this annual event benefitting the Penn-Trafford Area Recreation Commission (PTARC); go here for info. July 22: 2nd Annual Classic Car Cruise—included in regular museum admission; proceeds benefit the Save Bushy Run Endowment. July 1: “A Patriotic Celebration”—this annual event honoring all military veterans features a concert by the Ringgold Band (formed in 1852, one of the oldest community bands in the U.S.). Admission and parking are free, contributions are gratefully accepted. Womelsdorf Fire Company will have food for sale starting at noon and the concert starts at 1:30; please bring your own chairs or picnic blankets. July 8: Weiser Interpretive Sunday—enjoy a summer afternoon at the homestead learning about life in the Tulpehocken. July 4: Independence Day Program and 1st Pennsylvania Regiment Flintlock Shoot—learn about the different kinds of military troops that fought the American Revolution, drill with the local militia, tour the Boone house, watch blacksmith demonstrations, and more. Light refreshments will be available, but you can also bring a picnic. Admission is $4 for ages 4-12, $6 for anyone 13 and older. July 8, 15, 22, 29: Interpretive Sundays—spend summer Sunday afternoons learning about 18th-century crafts, trades, and activities. Included in regular admission. July 17-19: History Day Camp—participants will learn about the kinds of things Daniel Boone did as a child growing up in the Oley Valley. Camp is designed for kids entering grades 3-6; space is limited and pre-registration is required. July 25: Junior History Workshop—Camp Cooking is the focus as kids entering grades 3-6 learn how Daniel Boone would have cooked in the wilderness; space is limited and pre-registration is required. You can download a registration brochure for History Day Camp and Junior History Workshop here. July 7: Tours at Historic Pithole City-Guides will be available from 10 a.m to 3 p.m., and the museum will be open. This is a rare opportunity. Admission is $5 for adults and $3 for youths 3-11. July 28: Blacksmith Demonstrations—monthly demonstrations take place the last Saturday of the month through October. Included in regular admission. 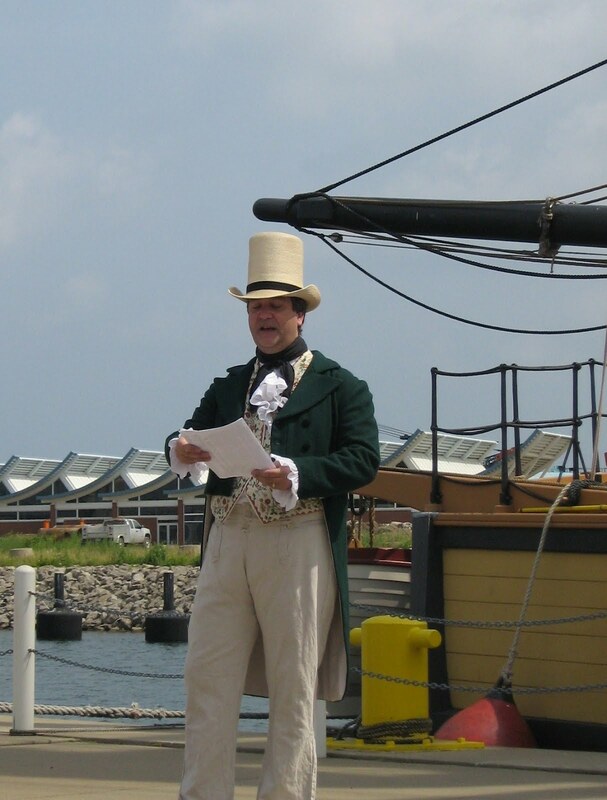 July 14-15: Armed Forces Tribute Weekend—celebrate veterans from the Civil War to the present day with local fraternal organizations, active duty service men and women, and living history reenactors. A swing-era USO Dance will be held off-site the evening of July 13. For more information, go here. July 14: Revolution at the Fort—explore Pittsburgh’s role in the American Revolution as you raise a liberty pole in Point State Park, drill with the local militia, and help design a historic flag. July 21: 16th Annual Celtic Heritage Festival—music, food, vendors, bagpipes and more to celebrate the Keith, Graeme, and Fergusson heritage of the site. For photos of previous festivals and updates on the entertainment schedule, go here. July 25-27: History Camp—designed for elementary age students, this program takes place in the morning; check the website for registration info. July 10-13: Summer Sampler Camp—geared for ages 5 to 11, this camp will explore various holidays through crafts, games, and food. Go here for details. July 17-20: Historic Trades Summer Camp—this week is geared for kids 11 and older and will focus on woodworking skills. Details are here. July 21-22: Lancaster Long Rifle: Lock, Stock, and Barrel—panel discussions, seminars, and more related to Landis Valley’s current exhibit (on view through December). Info is here if you’re interested in attending. July 28-29: Civil War Days—the site is transformed into a rural Pennsylvania village in 1863, with reenactors portraying soldiers and civilians. July 7: Antique Car Show—pre-war antique cars will be on display around the village, along with food, games, entertainment, and artisans. Free admission. You can register your car by calling 724/266-4500 x 114. July 21: Living History Day—reenactors and historical interpreters will help bring the village to life. Included in regular museum admission; start at the Visitor Center to purchase tickets. July 29: Rediscovering Peace Church—program starts at 3 p.m.
July 1: Historic Trades—the blacksmith and the joyner will be demonstrating their skills with iron and wood. July 8: Living History Theater—“The Request” explores slavery in 17th-century Pennsylvania through the story of Jack and Parthenia. July 9-13 and 16-20: Colonial Camp—each week-long camp provides hands-on learning as students explore life in the 17th century. Camp is open to children who have completed 1st through 6th grade. July 15: Open Hearth Cooking—although winter seems a long way away, the cooks will be starting to preserve some of the summer bounty for use during the cold weather that will surely come. July 22: Garden Highlights—spend some time in the kitchen garden and see what the gardeners are up to (they’ll even let you help). July 29: Animals at Pennsbury—meet the various animal residents of Pennsbury and learn about their ancestors. July 7-8: 38th Annual Bark Peelers’ Convention—this hugely popular event recreates the 4th of July celebrations of Pennsylvania’s early 20th-century lumber camp workers and “woodhicks.” For more info and event schedule, go here. For photos from previous years, go here. July 6: Registration deadline for Boot Camp for Kids—camp takes place August 4 and is open to boys and girls ages 8 to 13; go here for details and registration info. July 10: “Creating Victory at Forts Henry and Donelson: General Grant, Flag Officer Foote, and the Western River Navy”—Bruce Apgar, Cmdr, USNavy, will explore Civil War events on the western front in February 1862; presented by the Central Pennsylvania Civil War Roundtable. July 12-15: 20th Annual People’s Choice Festival of Pennsylvania Arts—celebration of arts and artisans held on the museum grounds (go here for details); parking fee charged. July 21-22: “VIETNAM Revisited”—living historians portray American combat and support troops “in country” in the late 1960s; visitors have the opportunity to accompany squads on short range patrols (closed shoes and long pants recommended if you plan to participate in these demos). July 28: Annual State College Last Cruise—antique, classic and hot rod car show on the museum grounds benefits Centre County Youth Service Bureau; go here for details. Parking fee charged. July 3-8: Reading Railroad Days—offered in conjunction with the Reading Company Technical & Historical Society, this program features an enormous HO-scale model railroad and highlights Reading Company rolling stock in the Museum’s collection. Included in regular museum admission, go here for more info. July 14: Three Authors and an Artist—a Civil War-themed event featuring authors Herbert H. Harwood, Jr. (The Railroad that Never Was), Diana Harris (Reflections of a Civil War Locomotive Engineer), and Scott Mingus, Sr. (Flames Beyond Gettysburg). Artist Bradley Schmehl will sign reproductions of his painting, Columbia Bridge Burning. 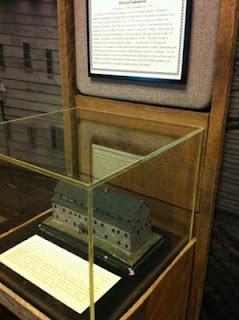 You can view the museum’s exhibit on railroads in the Civil War while you’re there. Included in regular museum admission; details and schedule here. July 18, 19, 20: Fossil Day Camps—a one-day camp for kids ages 9-12 is offered on three consecutive mornings; reservations can be made by calling 717/771-6997. July 25, 26, 27: Archeology/Native American Camps—another one-day camp offered three times, this one for kids 7 to 10 years old; call 717/771-6997 for reservations. NOW: Casting Call for the next Commander in Chief for the Christmas Crossing--the Friends of Washington Crossing Park have begun the search for the next person to portray Gen. George Washington for park events. If you think you have what it takes, email info@washingtoncrossingpark.org for details and an application. July 4: Celebrating American Independence—Glover’s 14th Continental Regiment will be on hand to provide a window into the past; there will also be readings of the Declaration of Independence several times throughout the day on the steps of McKonkey’s Ferry Inn. Admission is $8. The War of 1812. It’s sometimes called a forgotten war, and it’s certainly one of the least understood in U.S. history (although I’ve learned more about it from working with the folks at Erie Maritime Museum and Flagship Niagara). But it was a formative period in our nation’s history (and not just because it gave us “The Star-Spangled Banner”). 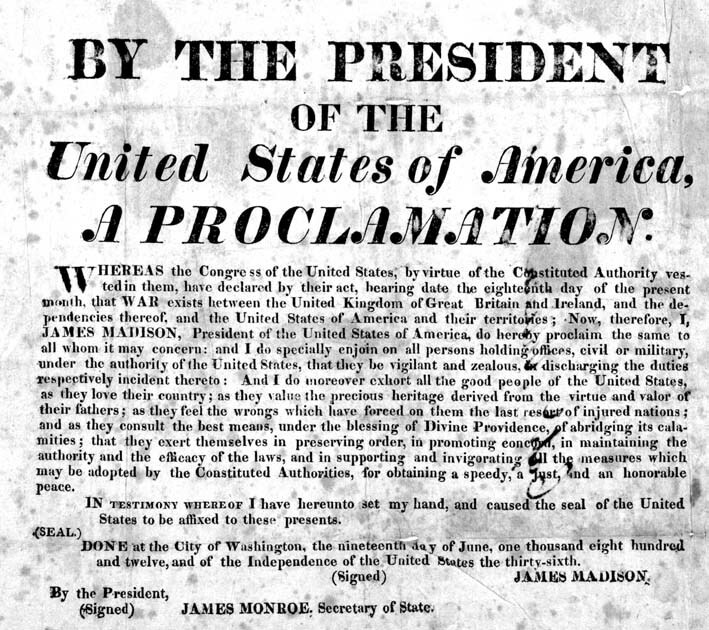 Many U.S. cities and states (not to mention Canada) are marking the 200th anniversary of the war; in Pennsylvania the primary focus is in Erie, where most of the US Navy’s Great Lakes ships were built. 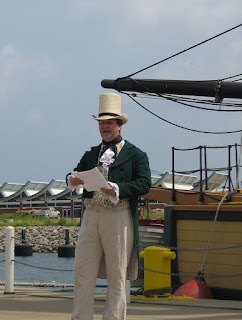 On June 18, the Erie Maritime Museum hosted an event to commemorate the 1812 declaration of war and President James Madison’s proclamation the following day. ADDED 6/26/12: Local coverage and great background info here. FUN FACT: there’s an old story I haven’t pinned down that iron produced at Cornwall Iron Furnace was used in building Niagara. We CAN say that 1812 was a very productive time at the furnace, and iron smelted there likely ended up in use for the US war effort, whether or not it made its way to Erie for the Great Lakes naval fleet. In other news, Ephrata Cloister recently received word from TripAdvisor that the site has been awarded a Certificate of Excellence for 2012 with an overall rating of 4.5 (out of 5 of whatever those circle things are on TripAdvisor). You can search for your favorite Trails of History site on TripAdvisor here (and if you feel so inclined, provide a rating and review based on your experience with us). And Eckley Miners’ Village shared photos of Patch Town Days here. With school tours winding down, the rhythm of life on the Trails of History shifts into a different phase, as we gear up for an even busier time of year. The summer months will be the peak of annual visitation at most sites, if the pattern of previous years holds true. We’re always happy to see gas prices ease downward, although we love staycationers just as much as we love folks from out of state. I wonder how many families realize what a great value we are, or how refreshing it can be to unplug everybody from their routine for a day or two. Yikes! Stop me before I wax rhapsodic about how things were simpler and slower in the past—they may feel that way to us, but many people in other times have felt the stresses of “modern” life and accelerating change as we do now. One of the interesting things about history, in my opinion, is finding out how those stresses are like our own and how they’re different. So anyway, time now—now?—for a few unconnected items that have accumulated on my virtual desk. 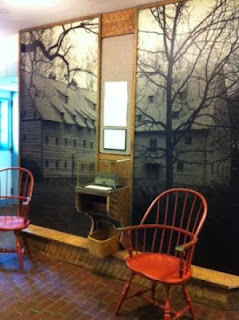 The folks at Ephrata Cloister were able to make use of an exhibit graphic from Winterthur Museum in Delaware to enhance the lobby in the Visitor Center. (Ephrata pieces appeared in an exhibit of Pennsylvania furniture at Winterthur last year.) Augmented by skilled staff and volunteers, the otherwise-discarded photo mural gained new life to welcome visitors and provide a space for highlighting items from the collections. By the way, this Sunday, dads get free admission at Ephrata for Father’s Day. Tomorrow, related to PHMC’s 2012 focus on foodways (official theme is “The Land of Penn and Plenty: Bringing History to the Table”), Washington Crossing Historic Park is offering a program on CHOCOLATE. Need I say more? You can get details here. Archaeological excavations at Graeme Park are going on this summer to investigate what may be a garden wall from the 18th century. The lead investigator is blogging about the project here. If you've stuck with me this far, thank you. Although one of the goals of Trailheads is to share glimpses of the work that goes on out of the public eye, that’s proven to be harder than I thought. Where it’s worked, it has usually been because staff at Trails of History sites, or central office staff who travel to sites, have contributed photos and info to our joint effort. I’m really grateful for the help. A couple of weeks ago we were able to show you some photos of the new exhibit installation at Drake Well (you can find photos on PHMC’s Flickr account here, and we’ll continue to add more in coming weeks). Curator Sarah Buffington works on a model that shows the streets and buildings of Economy, a fraction of which constitutes the historic site visitors see today. Interns Elizabeth Dofner (Edinboro Univ.) and Sarah Lerch (Allegheny College) with just a few of the photos that will be included in the exhibit. Sarah Lerch gave me an update on her internship experience so far: "The best part about my internship is that I can see the work I'm doing as eventually helping the site. I love that I am a part of something bigger than myself or just the summer. The exhibit we are working on will be on display for a year or more, and it is truly an honor to play an active role in its creation." Intern Dorian Gilliam (Penn State Beaver) scans archival collections for use in the exhibit. In addition to exhibit planning and the myriad of everyday activities at Old Economy, major work has been accomplished cleaning the Grotto, built in 1831 in the garden of Harmony Society founder George Rapp’s house. The Grotto is said to be a metaphor for the Harmonists themselves, rough on the exterior, but refined inside. The project team consisted of Carl Bolton of Perfido Weiskopf, Tim Noble of Noble Preservation, Steve Young of Young Restoration Company, with staff from Old Economy and the PHMC’s Division of Architecture and Preservation. There’s so much listed here that I don’t want to bog things down, but I wanted to mention that PHMC sites are participating in the Blue Star Museums program, through which museums all over the country offer free regular admission to active duty service members and their families between Memorial Day and Labor Day. PHMC sites are proud to take part in this effort, and in fact, we welcome military families free of charge year round. June 1-3: Fire at the Furnace and Arts on Fire—TONIGHT is the Fire at the Furnace fundraiser at Scranton Iron Furnaces (here for details, you can get tickets at the door for a donation of $20). The Arts on Fire festival is on Saturday and Sunday, with industrial artists working in glass, metal, recycled materials, and clay (plus children’s activities, food, and music). Admission to the Arts on Fire festival is free. June 7: Brandywine Battlefield Task Force public meeting—the BBTF is seeking public input on the Brandywine Battlefield Preservation Plan, which concerns an area beyond the boundaries of our Trails of History site. For more information on the planning to date or to register for the public meeting, go here. June 25-29: Summer History Camp for Grades 3-5—summer camp is held weekly through early August for different age groups. Check the website for details and to register. June 16: Lecture—Dr. Karen Kehoe, assistant professor of history at Saint Vincent College, is the speaker. Lecture (and general meeting) is free to members of the Bushy Run Battlefield Heritage Society; there is a $5 fee for non-members. June 3: Colonial Craft and Demonstration Day—craft demonstrators will share the historical context, materials, and equipment of a variety of mid- to late-18th-century trades (some demonstrators will have items for sale). June 16: Evening on the Green—this program features fiddle music, tour guides in period dress, colonial era games and toys, old-fashioned ice cream making, and mead samples (go here for details). June 13: Model T Reunion Tour—vintage cars from 1909 to 1926 will be on site as the Model T Reunion tour swings through the oil region. June 21: Summer Heritage Lecture Series—check the website for details. June 30: Blacksmith demonstrations—this is a recurring program offered the last Saturday of each month through October. June 16-17: Patch Town Days and Antique Car Show—the village comes to (19th-century) life with music, food, dramatic performances, dancers, and vendors both days. On Saturday only, there will also be a selection of antique cars on site. June 14, 21, 28 and July 5: Guide Training—are you interested in history and enjoy sharing your interest with others? Consider becoming a volunteer tour guide. No prior knowledge of Ephrata history is required. For more information, go here. June 17: Father’s Day—dads get in free today, and there are guided tours on the hour from 1 to 4 pm. June 1: TONIGHT, the US Navy Band will perform a free concert at 7 pm in Erie’s Liberty Park as part of the Perry 200 celebration. Park at the Erie Maritime Museum and take the shuttle. (As of Thursday afternoon, the concert was still on, with bad weather forecast to move out of Erie in the afternoon.) BAYFRONT CONVENTION CENTER; PARKING IS FREE. (Concert moved due to weather--go here for info.) The Navy Band will also perform briefly at tomorrow night’s Mariners Ball, but that’s sold out so this is your chance. June 9: Kids at the Fort—this month’s installment in the Summer Saturdays at the Fort series focuses on what life was like for children in 18th-century Pittsburgh. There will also be a book signing and talk by Brady Crytzer, author of Fort Pitt: A Frontier History. June 13: Outdoor Concert—the Ambler Symphony Orchestra will perform on the front lawn; bring lawn chairs, picnic suppers (if you like), and flashlights. Rain date is June 20. More info here. June 19-22: Summer Institute—celebrating its 56th anniversary, Institute offers a wide range of hands-on classes, lectures, tours, and evening events for adults (and summer camp activities for kids so the whole family can attend). Go here for a brochure. June 26: Hands-on History Days—chores, games, crafts, wagon rides, a one-room schoolhouse lesson, and more for kids of all ages ($10 per person, children 5 and younger get in free). June 2 and 16: Living History Days—the village will be alive with activity and demonstrations throughout the historic buildings. Start at the Visitor Center for tickets and info on the day’s events. June 3: Historic Trades—the blacksmith and the joyner will demonstrate their skills from 1 to 4 pm. June 8: Dine Around the Manor—a progressive dinner will take you to various buildings on the site; in-between you’ll find demos of 17th-century cooking and strolling musicians. End the evening in the Visitor Center with dessert, a basket raffle, and a live auction. Check here to see if tickets are still available. June 10: Living History Theater—“John and Mary Sotcher: May 1702” brings us up-to-date on William Penn’s steward and housekeeper, married last fall and currently responsible for taking care of Pennsbury while Penn is in England. June 17: Open Hearth Cooking—the cooks will be making cheese and other dairy recipes, and they’ll talk about the uses of milk in the 17th century. June 30-July 8: Kutztown Folk Festival—the Road Show hits the road for the summer, hosted by the Berks County Historical Society and Kutztown Folk Festival. Weekends in June: T-Shirt Tour Weekends—wear an Armed Forces t-shirt any Saturday or Sunday and take part in a guided tour at 1 p.m. for only $4.00. June 6: "Belgium Under German Occupation During World War I"—speaker is Dr. Sophie de Schaepdrijver, associate professor of modern European history at Penn State, talking about the life, work, and remembrance of Gabrielle Petit, set against a backdrop of military occupation, secret intelligence networks, and divided postwar memories; part of the Friends of the PA Military Museum speaker series. June 14: Flag Day Celebration—State College Elks Lodge and local veterans organizations sponsor this annual Flag Day service and U.S. Flag Retirement Ceremony. If you have a U.S. flag that is no longer serviceable, bring it along for proper disposal. June 2-3: Norfolk Southern Days—this event will celebrate the 30th anniversary of Norfolk Southern and explore some of its predecessor railroads. Of particular interest will be the Pennsylvania Railroad heritage unit, a new locomotive with a traditional PRR tuscan red and gold paint scheme. Go here for more details about the event. 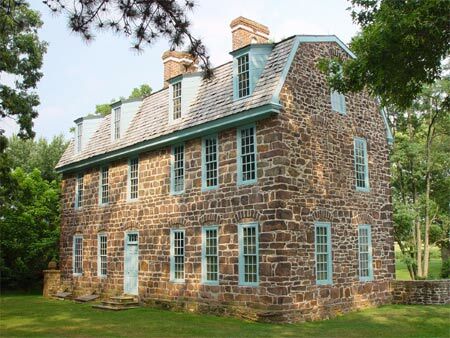 June 2: “Southern End” House and History Tour—the Southern Lancaster County Historical Society hosts its third annual house and history tour to benefit the Robert Fulton Birthplace in Quarryville (details here). Call 610/593-6989 for details and tickets. June 23: Exhibit opening—“Made in Somerset County” features some of the finest examples of local craftsmanship, including work by weavers, blacksmiths, coopers, cabinetmakers, gunsmiths, and more. Included in site admission (free to members), the exhibit will continue into the fall. June 9: 2nd Annual Fatherhood and Family Celebration—this program features speakers, dance classes, films, workshops and children’s activities. Free admission. June 15: 3rd in the Burg/Learn at Lunchtime—museum admission is free from 11 am to 1:30 pm, and there will be free tours at 12:15 and 1 pm. “Learn at Lunchtime” will continue every Friday through Aug. 31. June 16: Exhibit opening—“Art of the State,” the annual juried exhibition of Pennsylvania artists opens at 6:30 pm, with an awards ceremony at 7 (followed by a reception). June 20: Story Time in Curiosity Connection—free with museum admission, this children’s book program will be offered every Wednesday morning at 10 am through Aug. 1. 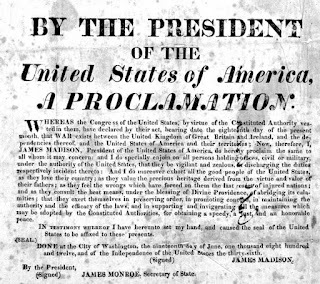 ALSO, at noon on June 20, there will be a free lecture and book signing by Thomas J. McGuire, author of Stop the Revolution: America in the Summer of Independence and the Conference of Peace. June 10: Strawberry Festival—the day before the event, volunteers start churning hundreds of gallons of ice cream and hulling mountains of local berries. Yum! June 16: American Heritage Chocolate Program—offered in partnership with Mars Chocolate North America and fitting PHMC’s 2012 foodways theme, this program includes a lecture (with samples!) on the kinds of chocolate consumed in the American colonies and a lecture on 18th-century chocolate processing. Be still my heart.